David Gandy; Jaguar XK 120. When David Gandy emailed me asking if I wanted him to put my name into the hat to shoot him for the cover of Tempus Magazine, I don’t think there was going to be any other answer other than ‘YES PLEASE!’. We also made full use of the loan of a gorgeous Jaguar XK 120. Link to the full article here. David is an absolute gentleman and I was so chuffed to have been able to do this shoot. Also, a super huge thanks to Pendine for use of their showroom at Bicester Heritage! PS. Some of you Steve McQueen fans may recognise a shot of mine below. 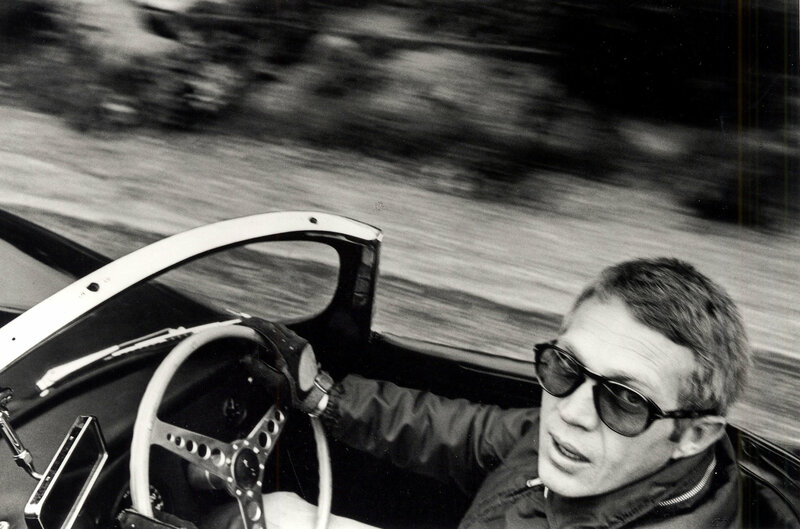 I have always been in love with this image of McQueen in his XKSS, taken by William Claxton, and wanted to recreate the iconic photo with this era’s driving stud! Previous article Flywheel Festival; 2018. Next article Highland Cows, Switchbacks and The SL Shop’s Mercedes 280SL. If I had the money and an impressive car, I’ll bet you could even make me look good. Your photographic talent have not fallen into habit over the years I’ve been following your work. To the contrary, you always bring a fresh and perceptive eye to your work much to my delight.